Irina Baronova was one of the legendary ‘baby ballerinas’ of the original Ballets Russes de Monte Carlo. Born in St Petersburg in 1919, she escaped with her parents to Paris where she later became a soloist at the Paris Opera Ballet. She danced with various Ballets Russes companies, touring to Australia in 1938–39, and later with American Ballet Theatre. Known for her technical virtuosity and personality, Baronova was a vehicle for work by Fokine, Massine and Balanchine among other choreographers. Baronova lives in Byron Bay near her daughter. Jenny Sages met the ballerina last year while visiting her own daughter, Tanya. A few months ago, at the Australian Ballet Centre in Melbourne, Sages watched the final rehearsals of three Fokine ballets, Les Sylphides, Scheherazade and Le spectre de la rose, with Baronova working as a consultant. ‘The portrait talks about the intensity of the engagement with a young ballerina and a new generation of dancers’, says Sages. Born in Shanghai of Russian parentage, Sages came to Australia in 1948. She studied at East Sydney Technical College, in New York and then with John Olsen and Mary White. After freelancing for 30 years as an illustrator, she has painted full-time since 1985. She has been a finalist in the Archibald Prize 15 times since 1990 and has been highly commended six times. 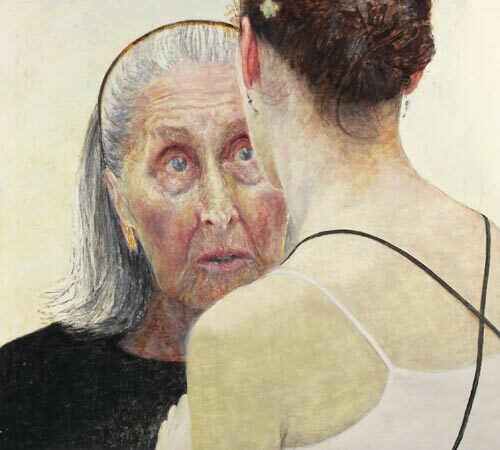 She won the 2005 Wynne Prize and The Portia Geach Memorial Award for portraiture in 1992 and 1994. Her work is represented in numerous public and private collections including the National Portrait Gallery and the AGNSW.